The use of Course Management Systems such as WebCT and Blackboard for teaching information skills is not new. Many libraries in higher education institutions have designed user education programmes using electronic media, including WebCT. The University of Botswana bought into this initiative because of the need to address the problems of large classes, assessment of students in relation to large number of scripts to mark, shortage of staff, timetable clashes, and the need for consistency in delivery of content. The implementation of the pilot by the library started in 2003 with the first year social science students. This article shares the library's experiences during implementation. Keywords: Southern Africa; WebCT; information literacy; e-learning; library. Hadengue (2004) describes online learning, as an educational concept, which implies using local, extended networks, or the Internet to spread information, to communicate, and to support any other kind of educational interaction between students and teachers. It is the effective learning process created by combining electronically delivered content with (learning) support and services (Waller and Wilson cited in Wang and Hwang, 2004). Other terms in use for this concept, according to Hadengue, include e-learning, virtual learning, distance learning, and tele-learning. E-learning strategies according to Hadengue, offer a larger amount of information than traditional courses as well as easier access to that information. Both controlled information sources (i.e. provided narrowly by the teacher's text book) and open information sources are available in parallel. It thus opens the way to greater diversity in the learning process through which the student masters the information provided. E-learning is becoming the way to go if student-centred learning is to be encouraged and if education is to be made available to all irrespective of location and status in the society. E-learning has captured the attention of many in the last couple of years. It arose as a result of the development of Internet technologies, especially the Web. E-learning is said to be an innovative way of learning suited to meet today's learners' learning requirements, particularly as the industrial economy evolves into a knowledge-based economy. It is sometimes referred to as a revolution in learning (EU-Asia e-Learning, 2003). As noted in the second issue of Manchester Metropolitan University (2002) Library News, e-learning initiatives are mushrooming as the use of Content Management Systems like WebCT expands across all the University Faculties. Other term in use is Course Management Systems. This, according to the Library News signals the beginning of changes in approach to teaching and learning, as online modules are used either in supporting and supplementing traditional courses and teaching models, or as completely self-contained courses, accessed both on and off campus. Course management systems such as WebCT and Blackboard (courseware) according to Machovec (2001), have the potential to leverage the rich array of electronic resources and newer library services that are now becoming popular. According to Shank and Dewald (2003), the benefits include the ability to distribute resources (such as research guides and websites), extra communication tools, and a potential medium for assessment. Other benefits, according to the authors, include the possibility of adding resources into the university's general courseware interface, including links to the OPAC and databases, global pathfinders, a virtual reference desk, and document delivery services. Virtual reference services are especially ideal for course management systems (Machovec, 2001). This possibility of being able to promote library resources through the courseware is particularly beneficial to not only the on-campus student but also students who cannot come to the campus or the physical library. Hadengue (2004) identified e-learning strategies in use, in libraries, to include providing online content for improved information searching and management. One model is using new information and communications technologies for information (e.g. providing timely online help to users). Course management systems can also be used as a library training tool. For example, according to Hedengue (2004), a web-based user's guide designed as a training course with progressive levels may be seen as using new information and communications technologies (e.g. Course Management Systems) for learning. This strategy offers a unique opportunity for librarians to collaborate with university teachers, to offer courses tailored to end-users, and to provide professional tutoring in information literacy (Hadengue, 2004). Stubbings and Brine (2001) particularly reported a growing perception among librarians of the need for students in Higher Education (HE) to enhance their information literacy skills. Literature attributed this to several factors such as increase in student numbers; students with different levels of skills; changes in learning and teaching practices that place a greater emphasis on student centred learning; a decrease in library expenditure, resulting in more students chasing less resources; and an increase in the availability of electronic information that has led to the need for students to have greater critical and evaluative skills (Ray and Day, 1998; Brown and Gibbs, 1996; and Brophy, 1993 cited in Stubbings and Brine, 2001). On user benefits, the use of e-learning systems allows learners to access modules independent of place and time. Learners who prefer support can also access modules in self-paced laboratory sessions with the assistance of an instructor; while learners who have attended face-to-face sessions can use these modules for review and reinforcement (Harris and Fletcher, 2002). It, also, according to Wang and Hwang (2004) enables users to submit and retrieve information and incorporate collaborative tools like chat, threaded discussions, email, white boards, Internet links, etc. Further, it can help users keep track of learning progress, download and upload learning materials, and link to relevant resources. Literature points to a situation where many libraries in higher education institutions have designed user education programmes using electronic media (Wade, n.d.). The Texas Information Literacy Tutorial (TILT) developed by the University of Texas is one example of an on-line tutorial (Wade, n.d.). The University of Wisconsin-Parkside Library developed a web-based information literacy tutorial consisting of a set of modules and quizzes managed through WebCT (University of Wisconsin-Parkside, 2002). In developing the library's web pages, the library was assisted by "...Instructional Technology Support staff, including a graphic designer and a curriculum specialist." (University of Wisconsin-Parkside, 2002). 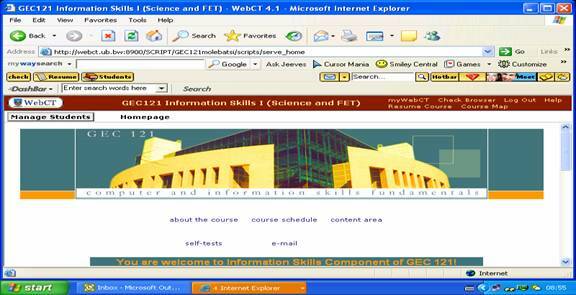 The Steve Biko campus library of the Durban Institute of Technology (Kromberg, 2002) also employed the online learning concept using WebCT. At the Selly Oak campus of the University of Birmingham, information services (IS) staff provided face-to-face ICT component of the core skills module, teaching 5 sessions for each group plus a test under examination condition. This was however found to be extremely resource intensive. 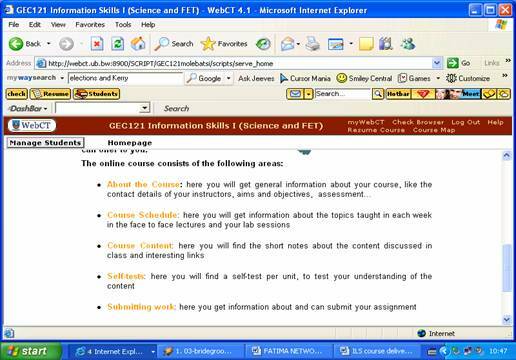 In 2001-02, the IS and academic staff jointly decided to replace the tutor-led credit-earning core skills module with a WebCT course to address the learning and resource issues, allowing the students to work through materials as self-paced learning. This also allowed opportunity for IS staff to develop their skills and knowledge in the use of WebCT (Fratus and Woodcock, 2003). Reynoids, Curl, Mai, and Smith (2003) also reported that their institution took full advantage of WebCT course management software in its information strategies course. The course initially adapted the conventional linear format used in the classroom but later had "to deconstruct and reconstruct the course for" online delivery. 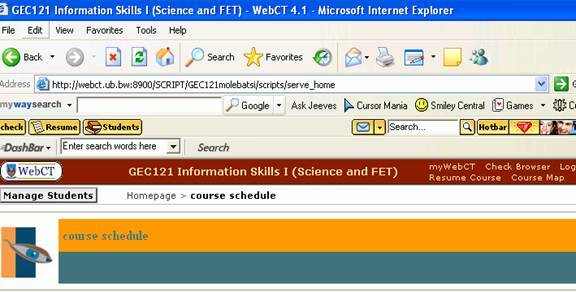 And with the WebCT course management software, the instructors were able to integrate assignments, tests and self-tests, discussion via bulletin boards and chat rooms. The University of Botswana (UB) recently made a major investment in a course management tool, the WebCT, as part of the integration of information technologies to support flexible teaching and learning. The University recognizes the need for a paradigm shift in the way teaching and learning is conducted towards producing a student who is..."independent, confident, self-directed, critical thinkers..." (University of Botswana Vision, nd). The University believes that online learning can help achieve the university vision, and it has therefore, become an integral part of teaching and learning. There were more than seven proposals submitted, out of which five were approved. The problems with negotiating time for the Information literacy Skills (ILS) delivery, the increases in students' enrolment resulting in large classes for both the GEC 121 and 122 (the two compulsory GEC-2 courses, see explanation below), and the desire to foster partnership between librarians and academics underscores the library's participation in the e-learning pilot project. The University of Botswana Library (UBL) has had a long history in offering user education (Lamusse, 1992; Lumande, Mbambo, and Roselle 1996; Mbambo and Roselle, 1999; Roselle and Mbambo, 1996). It has been offering orientation to its first year students, and bibliographic instructions, to senior students. This required that the library staff negotiate with course teachers for time to teach information skills beyond how to use particular information resources. Initially, this was done at an informal level, and therefore not all departments were participating. This changed into a formal, examinable two-credit module, integrating information literacy skills with computing skills, under the General Education Course (GEC) area 2 (Computing and Information Skills) courses in 2002, and was made mandatory for all first year students. Students are required to take two modules: GEC 121 and GEC 122 - Computing and Information Skills Fundamentals I and II. However, the advent of GEC coincided with the increases in students' enrolment which resulted in large classes for the two compulsory courses, and the desire to foster partnership between Librarians and academics, which now more than ever before had become necessary as the library strove to become a learning resource centre. In order to actualize the UB's vision it was necessary that Librarians and academics work together to equip the students with knowledge in their chosen fields, and also to teach them how to learn independently. Participating in the e-learning pilot project as well as being active members of University of Botswana e-learning (UBel) Committee was seen as promoting this learning resource centre concept of partnership with teaching staff. University of Botswana Library (UBL) was keen in taking advantage of the virtues or positive attributes of e-learning as a direct response to one of the UB's vision aspirations of "developing a student-centred, intellectually stimulating and technologically advanced teaching, learning and research environment." The pilot project focused on the social science students who were already part of the e-learning project for computing component of the GEC-2, and would thus have undergone instruction on how to use WebCT before the Information Skills component commenced. The library assumed that most students stayed on campus and would, therefore use computers in the computer laboratories, and the library. It was also assumed that part-time students would have Internet access at their work places, with a few students having Internet access at their homes. The UBL in its project proposal admitted that information literacy skills are fundamental to the students' academic life on campus as well as adult life, being part of the "life long learning" process. UBL also acknowledged the paradigm shift taking root at UB within a "...technologically advanced teaching...environment" (UB Vision). This further suggests the need for information skills tenets and ideals. Secondly, as the world becomes increasingly globalised and the technological information expands, a non-information literate person is likely to find the variety of information sources and quantity of information overwhelming and threatening. The ability and skills, therefore, to access a variety of information sources by employing all available ICTs and evaluating them for accuracy and relevance, is important during ones academic life, in the workplace and above all as the foundation upon which the concept of democracy (Botswana Vision 2016) is based and thrives. Information Communication Technologies have been identified as the way of the future and to that extent UBL has pioneered many new IT based resources for the benefit of customers. Currently, UBL programmes and services employ ICT for: technical processing using Innovative Interface Library Software called INNOPAC, communicating with customers, and provision of services via Internet, e-mail and cd-roms. E-learning mode would add another feature to life-long and open learning by addressing the problems of delivering to dispersed and large numbers of students. The objective of this article however, is to share the library's experience with other libraries that might want to deliver information skills course through the use of WebCT. Seven subject librarians formed the e-learning pilot project team (subject matter experts, SMEs) for the library. The team was responsible for completing the EduTech "Proposal form for an e-learning Pilot in 2003" following the approved guidelines. The workflow paired the e-learning team with an instructional and a graphic designer in the design stages. The team attended a number of training workshops in which it learnt how to use the WebCT software. One of these is 'Introduction to e-learning', which was in two parts: Part 1: Principles of e-learning and Part II: Planning for e-learning. Two members of the team were also trained on web design using Microsoft FrontPage and how to use it to deliver materials to WebCT. The project team as content experts had several planning meetings with the CAD Instructional and Graphic Designers. Accordingly, each component started with clearly stated learning objectives. This was followed by a brief and concise contents (to avoid continuous scrolling on the scrollbar) presented in the form of conversation as against the free flowing prose of lecture notes being given out to students. It also included relevant hyperlinks (many of which were in-text but not too many so as not to take the students completely away from the subject at hand) and references (for further reading). The team also received assistance on how to set quizzes and self-tests. On the suggestion of the Instructional Designer, the team came up with an "anchor", a story line character, serving as instructional guidance throughout the online course to introduce the information skills component of the programme. This character enhanced students' identification with the ILS course. This is a "muscled" book, symbolising that "Information is Power". The team discovered that the online course design was still like the design of face-to-face instruction. This is because instruction was still based on course goals and learning outcomes. The course schedule still reflected a balance between the amount of instruction needed to meet the goals of the course and the time available. The essence, it seems, was to create a virtual classroom where students did not need to rely on face-to-face interaction with the instructor to learn the content. The course schedule was therefore designed to accommodate the two modes (figure 1). The production of hypertext mark-up language (html) content pages involved the conversion of content from Microsoft Word format to html using Microsoft FrontPage. The online course thus consisted of the following parts: welcome page, information pages, and content pages, which included interactive self-tests per module and a communication area. The placement of the course on WebCT involved designing the logo; welcome page, standard html template for the course content pages; inserting graphics, production of html content pages, uploading of html pages to the WebCT platform and restructuring of the html pages in WebCT. The Instructional and the Graphic designer from CAD were very instrumental to the final design of the online course. They helped in designing the logo, the html template, the welcome page as well as all the graphics that illuminated the online course. Two members of the team (who had been trained) participated in the production of the html content pages, and uploading of the pages to WebCT. See figures 2, 3, and 4 depicting the homepage as it appears in WebCT. All members of the library e-learning team subjected the product at every stage to some rigorous scrutiny before it could be finalized. Having finalised the materials, they were uploaded on WebCT and made available to all library senior staff for their comments using passwords and a common user name provided by the Instructional Designer. The e-learning team looked into the comments, and agreements were reached on what needed to be changed in line with comments received. Prior to implementation, the project team had two meetings with the Social Science subject team members, who were to deliver the course, to explain the project to them so that they could own the course. They were briefed on what was expected of them and asked to further study the course schedule and content. They were given opportunity to ask questions on areas they did not understand. At the meeting, it was emphasized that social sciences students had to be introduced to the WebCT course and all the units and self test quizzes. In addition, it was explained that the social science students had to do their OPAC exercises in the laboratory using WebCT course materials. In implementing the online course, the team seconded one of its members to join the four members of the social science teaching team (instructors) to ensure that the implementation schedule was adhered to, and that problems were reported promptly. The total number of students who took the course were 750. WebCT was again introduced to the Social Sciences students in the first week of teaching. The course was allocated one hour for face-to-face delivery of the theory and two hours for laboratory session per week. The first hour of each laboratory session was spent on demonstrating access to WebCT and hands-on practice, and the second hour for laboratory assignments, through WebCT. Online course delivery is new to UBL; the library was therefore faced with three major challenges. These include: the selection of the project team, conforming to the rules of writing for online course delivery, and style of instructions delivery. The library practices a version of subject librarianship, in which each librarian (except for the librarians in the Resource Management and Customer and Extension Services divisions) is responsible for a cluster of subjects (say two to three subjects) one of which must be his/her subject background. Based on this, a group of librarians services the information needs of a particular faculty in the university thereby constituting a subject team. Each of these groups is also responsible for the Information Literacy Skills instructions under the GEC area 2 programme of the university. The library management however, discovered that none had experience in online course delivery. Although, some were quite literate in IT applications and also have knowledge of web design, these skills did not cut across all librarians in all the faculties represented in the library. Some were also not comfortable with teaching credit-earning ILS under the new semesterised system. The management also noted that only the students from the Social Sciences faculty would be taking part in the pilot project and would require involvement of a member of the subject team. With all the above taken together, the library management was faced with what to consider in constituting the project team. One of the policies of the library however is that all librarians must be equipped to function effectively in a learning resource centre for which the library management has committed itself. It was therefore decided that: all identified staff with IT skill and knowledge of web design must be part of the team; and that at least each subject team must be represented, one of whom must come from the faculty where the project is being piloted (i.e. Social Science). And having been advised of the wisdom in having a small number of individuals constituting any project team, the library management succeeded in selecting seven librarians into the team. The members of this team were expected to cascade whatever they learnt through the project to the team, which the library management intended to constitute to handle the GEC 122 pilot project. As at the time of writing this article, a team had been constituted for this purpose, which included two members of the first project team. One of the skills required is how to write for online course delivery especially one that would cater for distance learners, a group to which the library is also committed to serving. Although about three of the team members have taught in secondary schools prior to joining the librarianship profession, with one or two having background in education, none was equipped with this vital skill, except for a two-day writing workshop organised by a staff of CCE, which some members of the team were fortunate to attend. All the team members were only familiar with the free flowing narrative way of writing lecture notes rather than the interactive style. Unfortunately, the library also had nothing to fall back on; as such online courses (i.e. for Information Literacy Skills) are not freely available on the Internet. For the team to produce appropriate online teaching materials therefore, the instructional and graphic designers had to be invited. The library had no problem getting the services of these experts since the CAD had promised support for the project. These two UB employees belonged to CAD. Notwithstanding the availability of the experts, the assistance they could render was found to be limited. The assistance was limited to the advice on the appropriate structure and style of presentation of materials, the need for the materials to be interactive, and also the need for brevity. The team had to grapple with putting into effect this style of presentation of contents as explained to the team by the instructors i.e. the need for a preamble, the kind of leading questions to ask, and the need for the contents to be presented in an interactive manner, a skill, which requires experience probably from years of creating online course for distance learners. The team tried but was limited by the lack of such experience. The ILS tutorial on WebCT of the Edge Hill library (Lancashire, UK) availed to UBL by the Edge Hill library however provided a useful reference point. All the members of the team were familiar with face-to-face course delivery, where communication with students is instant, assessments are either carried out through tests in class or through take home assignment, and students' participation can instantly be monitored. Course delivery online was therefore a challenge, particularly online assessment, online communication with students, and the need to constantly monitor student's participation online. The team carried out online assessment for the theory with guidance from the instructors but not for the practical exercises. The team agreed to suspend online communication with students until such a time the library is sure that staff would be able to cope with the frequency with which they would have to respond to emails from students. The team also considered in this case the rising population of the first year students, and the likelihood of the second and third year ILS courses starting soon. The instructors however, noted that the students were not accessing WebCT in sufficient number. numbers. TheThe students were said to have complained that library computers were never available as Personal Computers were always occupied and that computer labs were always in use for formal classes which made it difficult for them to do independent learning using the computers. Their concern was that UB computing infrastructure was not yet suitable for online learning. Similarly, the instructors themselves observed that due to the shortage of computing facilities, students ended up seeking help from the instructors and that this took a great deal of the instructor's time. This was particularly so when students had been given tasks to complete. They noted that a good number of library computers were not working. Sharing of computers was also said to be common among students. The instructors also reported limited support from the library systems unit, as well as constant server breakdown. The WebCT could no doubt be used to address many challenges of instruction delivery. However, it requires adequate planning, which must address the logistics of implementation. Prior to implementation, it is important to assess the adequacy of facilities. The university would need to put in place a system that ensured that students in general have adequate access to computers, even if it meant keeping the departmental computer laboratories open for 24 hours. Brophy, P. (1993). Networking in British academic libraries. British Journal of academic Librarianship. vol. 8, no. 1, pp. 49-60. Hadengue, V. (2004). What can e-learning do for university libraries? Library Review, 53 (8), 396-400. Lamusse, F. (1996). Report on Student Orientation, 1992 in take. University of Botswana Library. Library plans for NDP 8: 1997 - 2003 (Doc. UB NDP 8/040, 26 June). 6p. Lumande, E., B. Mbambo and A. Roselle (1996). Information Literacy Skills Programme. A report, University of Botswana, 10p. Machovec, G. S. (2001). Course Management Software: Where is the Library? Online Libraries and Microcomputers, 19 (10), 1-2. Manchester Metropolitan University, (2002). Library News. The MMU Library Newsletter for academic staff, 2. Retrieved March 11, 2004, from http://www.mmu.ac.uk/services/library/library_news/2002-02-summer.pdf. Mbambo, B. and A. Roselle (1999). Integrating Information Literacy Skills Instruction into the Curriculum: Comparison of Two Approaches. LOEX of the West: Collaboration and Instructional Design in a Virtual Environment. Ed. Kari Anderson, et al. New York: JAI Press, 145-158. Ray, K. and J. Day (1998). Student attitudes towards electronic information resources. Information Research. 4 (2). Retrieved December 6, 2003 from http://informationr.net/ir/4-2/paper54.html. Reynoids, L.J., S.R. Curl, B. Mai, and A.E. Smith (2003). Righting the wrong: mistakes made in the virtual classroom. Retrieved December 7, 2003, from http://www.asee.org/conferences/search/20528.pdf. Roselle, A. and B. Mbambo (1996). Partners in Education: The Faculty and The Library. Higher Education Development Unit Bulletin, No. 14, pgs. 14-15. Stubbings and Brine (2001). Reviewing electronic information literacy training packages. Retrieved December 6, 2003 from: http://www.ics.ltsn.ac.uk/pub/italics/issue1/stubbings/010.html. Thurab-Nkhosi, Dianne (2003). Introduction to eLearning Part I: principles of eLearning. University of Botswana, Gaborone. 23p. University of Botswana e-learning (2002). Guidelines and proposal form for an e-learning pilot in 2003. 7p. Wang, M. and Hwang, M. (2004). The e-learning library: only a warehouse of learning resources? The Electronic Library, 22 (5), 408-415.